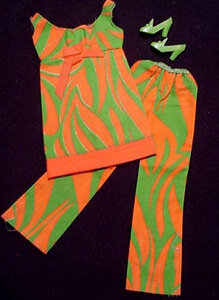 The orange and green cotton tiger print top can be worn as a mini dress or a tunic top with the bell bottom pants. The top / dress has an empire waist and an orange ribbon bow at the bodice. It has a solid orange hem. The bell bottom pants have an elastic waist. This is one of the easier to find ensembles from the late mod era.